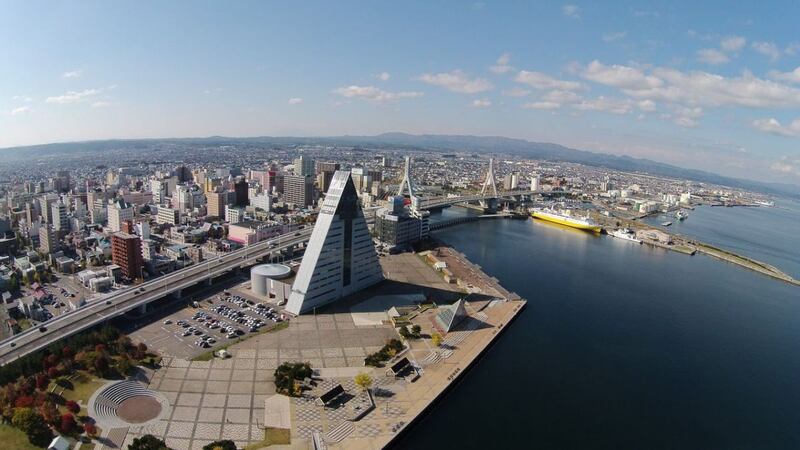 Aomori is the capital of Aomori prefecture, the most northerly of the island of Honshu. Even further north there is only Hokkaido. The city was for a long time the main port for connections with Hokkaido, at least until 1989 when the submarine tunnel was inaugurated. Today it is a quiet town always covered in snow in the winter and home to the famous Nebuta Matsuri in the summer. A massive 1200 meters long bridge overlooking the Aomori Bay. Both day and night, when the lights are turned on, it is the building that most characterizes the panorama of the city. Near Aomori station, just below one of the two main pillars, with their characteristic shape of an "A", you can climb some stars to go up to the bridge and from there enjoy a bird's eye view of the bay. 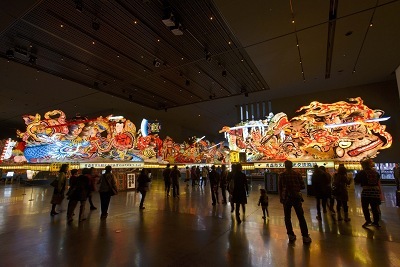 A museum that introduces the history and wonders of the Nebuta Festival of Aomori, one of the most famous traditional festivals in the Tohoku region. Inside you will find, among other things, 4 allegorical floats of those that were used in the last festival. You can also try, helped by the staff, to play the taiko drums and dance as people do every year during the festival. The museum is housed in a building covered with red metal slats. Está ubicado a las afueras de Aomori station. A visit is highly recommended if you think you won't have the opportunity to see the Nebuta Festival in the future. 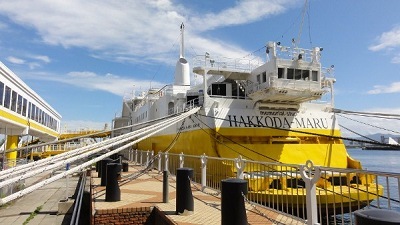 The Hakkodamaru is one of the old ferries used to transport passengers and trains from the island of Honshu to the island of Hokkaido, now out of service and permanently docked in the bay of Aomori where it serves as a memorial ship. Until the Seikan Tunel was opened (1988) the ferries were indeed the main means of transport between the islands of Honshu and Hokkaido, and Aomori was the main port in Honshu. Much of the ship can be visited today: the external decks, the cabins, the bridge, the engine room, and the vehicle deck that was once used to load trains too. The Hakkodamaru could indeed hold up to 48 wagons on four tracks and today on the ship's train deck you can visit some historical trains too. 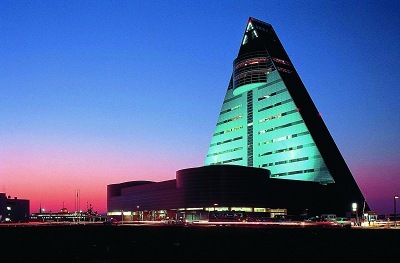 A 76-meter (15-storey) skyscraper located in front of the port of Aomori, which immediately catches the eye due to its curious triangular shape, which symbolizes the "A" of Aomori. It houses the headquarters of the tourist promotion agency of Aomori prefecture. The facility offers a tourist information desk, several souvenir and local products shops, a cinema with a panoramic screen that shows a 20-minute film on the most beautiful spots in the prefecture of Aomori, a panoramic observatory (13th floor) and a few restaurants. Also, twice a day (at 11:30 am and 2:00 pm), on a stage on the first-floor, you can enjoy Tsugaru-shamisen music for free, a musical genre that uses a traditional musical instrument originating in this area of Japan. The AUGA is a large building a few meters from Aomori station that houses various things inside. 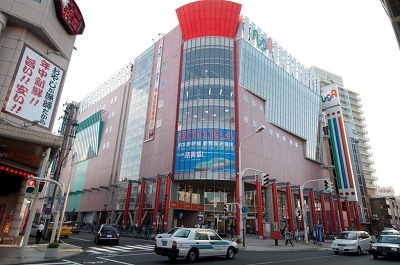 The first 4 floors are a shopping center with several shops mainly of fashion and accessories. The 6th, 7th and 8th floors host a public library. The basement (B1F) is the most interesting place for a tourist because there is a fish (and other fresh food ) market and it is mainly active in the morning. Inside you can have breakfast with excellent sushi and sashimi. 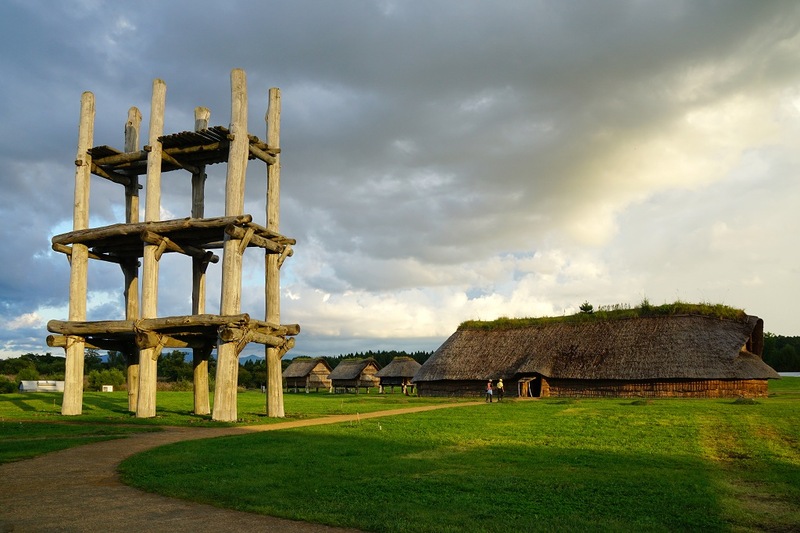 The archaeological site of Sannai-Maruyama is one of the largest in Japan dating back to the distant Jomon Period, the period of Japanese prehistory, traditionally dated between 14,000-300 BC, and during which Japan was inhabited by groups of hunter-gatherers. In particular, the Sannai Maruyama settlements date back to between 5500 and 4000 years ago. The site was accidentally discovered in 1992 during the preparatory works for the construction of a baseball field. After the excavations and the study of the site, several pit houses, warehouses and a tower were rebuilt. Visitors can enter the reconstructions, and see some of the original excavations. The excavation has also brought to light various artifacts in terracotta, stoneware, jade and lacquer, now on display in the adjacent museum (Jomon Jiyukan). For a complete tour of the park and museum, take into account 1 to 2 hours. The official website suggests some recommended itineraries. This place is located far from the center. From Aomori station it is about twenty minutes by bus to the closest bus stop (Sannai-Maruyama-Iseki-mae, 三内丸山遺跡前). Nearby this archaeological area there is also the Aomori Museum of Art. The Aomori Museum of Art is just a few meters from the Sannai Maruyama Site, from which the architects who designed the museum have drawn inspiration: some exhibition spaces are dug into the earth like the trenches of an archaeological excavation. Among the most valuable works of its permanent collection there are 3 giant paintings of Marc Chagall, and a series of works by artists born in the region, including the famous Shikō Munakata and Nara Yoshitomo. .
Asamushi Onsen is a spa town about 15 km from the center of Aomori and can be easily reached by train from Aomori station (Aoimori Railway Line). In this area you will find numerous ryokan with onsen, public baths, an aquarium, a beach and several other small attractions. This town is in a nice location. 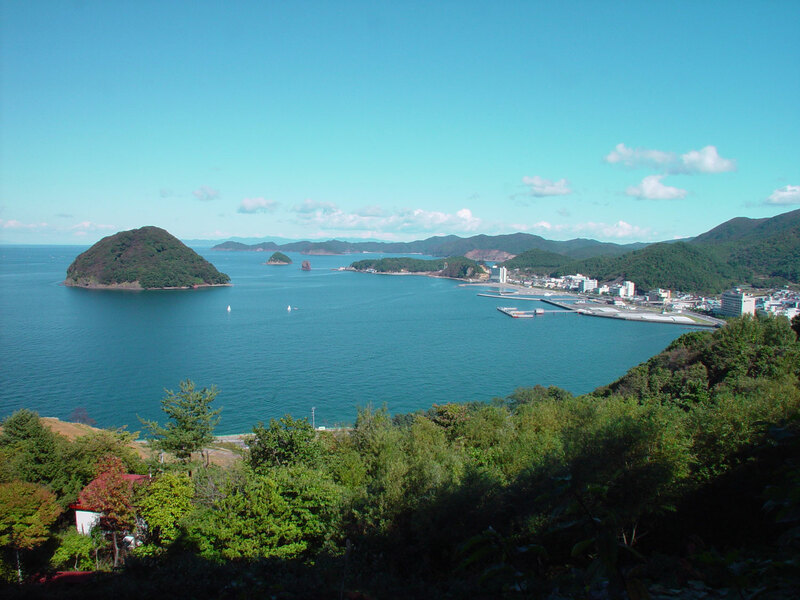 It is surrounded by mountains full of hiking trails for nature lovers, and it is right in front of the sea and opposite the small island of Yunoshima, which makes the view of the bay magical from some panoramic onsen like the one in the photo on the side. Hotels in Aomori generally cost very little compared to other Japanese cities, and the main attractions are all concentrated around Aomori station or a few minutes by public transport from Aomori station. An accommodation as close as possible to this station is the best. If you are looking for a day of relaxation with onsen, good food, and so on, you can go to Asamushi Onsen, where you can also find some ryokan (for example the Tsubakikan Ryokan). 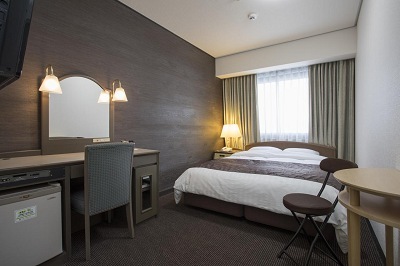 This hotel is located about 800 meters from Aomori station, along one of the main shopping streets of the city with numerous shops and restaurants nearby. 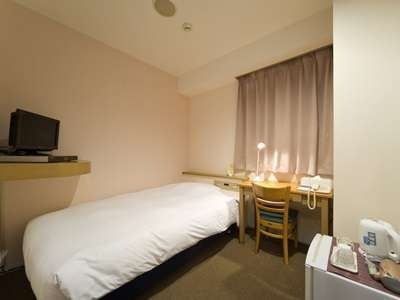 It is a typical Japanese business hotel with small rooms but equipped with all the necessary amenities. The breakfast is fantastic and costs only a few hundred yen more, very recommended if you want to eat a lot in the morning. In the lobby, in addition to newspapers and magazines, you will also find a small library of manga. If you want to play it safe, the Japanese chain Sunroute is a guarantee. Located just 400 meters from Aomori station, the location could not be better. Unlike other cities, here in Aomori hotels are cheap and so is the Sunroute chain, which is usually much more expensive than 4000/5000 yen per night. Rooms are larger than average, especially the twin rooms. There is a panoramic restaurant on the top floor. If you want to relax in the wonderful onsen with sea view of the picture on the side, you have to go to this fantastic hotel in Asamushi Onsen, a spa resort town (the town itself is a little bit rundown to be honest, but that's not a problem for you) just a few minutes by train from the center of Aomori. 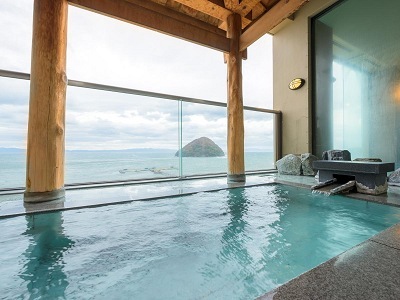 The hotel is just a few meters from Asamushi station, has beautiful onsen on the top floor, different types of rooms including spacious and romantic Japanese style rooms with sea view. It is possible to dine inside the hotel, amazing and unforgettable fish-based courses (you can add dinner for about ¥5000 per person when booking). 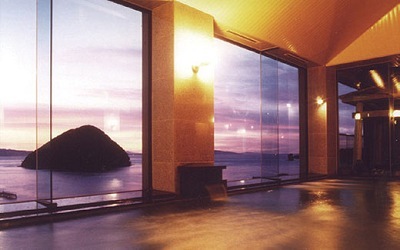 Highly recommended if you are looking for a relaxing night in Aomori or want to try a Japanese onsen. Do you know the so-called "Fuji apples" you can find in some supermarkets? They do not come from Japan, they are grown in your country probably, but this type of apple was invented right in the prefecture of Aomori and marketed for the first time in Japan in 1962. Thanks to the climate and tradition, over 50% of all apples (Fuji and other) in Japan comes from Aomori prefecture and the locals seem to be very proud of it. In Aomori you will find apples everywhere. Apple wine, apple liqueur, apple curry, apple pie, apple pastries and snacks, even apple burgers! Just a 1 minute walk from Aomori station you can find this kind of superstore that sells only local products including desserts, vegetables and fresh fruit and various apple-flavoured products. The most popular product in this shop is apple juice and cider, produced by the store itself. There is also a restaurant. 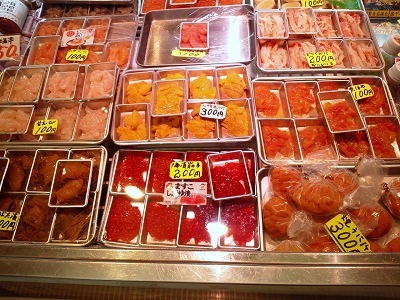 A fish market just a few minutes walk from Aomori station. You can visit this place not only to take a look at the market, but also for an interesting breakfast or lunch based on rice and fresh fish. Inside you can eat the nokkedon, a personalized donburi that has made this market one of the most popular attractions in the city. Here's how it works. You must first buy a bowl of rice together with a set of coupons (5 coupons 650 yen, 10 coupons 1300 yen). Once you have your coupons and your bowl of rice, you can go around the market and freely choose which sashimi or other topping to put in your bowl. Each topping will be exchanged with one or more coupons. When you have no more coupons to exchange and your tasty donburi full of fresh fish, you can sit in one of the many tables and eat. Tea and water are free of charge. A highly recommended experience. Shin-Aomori station is the reference station for high-speed trains in Aomori, and is the terminus of two shinkansen lines. The Tohoku shinkansen connects Aomori with Sendai (1h and a half, 11,210¥) and with Tokyo (3h and a half, 17,140¥). The Hokkaido shinkansen connects Aomori to the island of Hokkaido passing through the Seikan Tunnel, the longest submarine tunnel in the world. This line, currently under construction up to Sapporo, now connects Aomori with Hakodate (1h, 7,260¥) only. The city of Akita is connected to Aomori through the Ou Main line, in 160-200 minutes depending on the type of service. Along this line there is also the famous town of Hirosaki (45 minutes, 670¥). A number of bus companies connects the city of Aomori with Tokyo: JR Tohoku Bus, Konan Bus, Willer Express (the only one with an English website). It usually takes between 11 and 12 hours. Prices are around 5,000 to 8,000¥. Aomori has its own airport, Aomori Airport (AOJ), served by daily flights to Tokyo, Osaka and Sapporo. All flights are operated by Japan Airlines or ANA and prices tend to be quite high, on average at least 10,000 yen each way. From the airport you can reach the center of Aomori by bus or taxi. The port of Aomori is connected several times a day to the port of Hakodate by ferry, mainly used by those who need to transport the car. The journey time is about 4 hours. Two companies operate on the route, Seikan Ferry (from 1500¥ one way) and Tsugaru Kaikyo Ferry (from 2000¥ one way). If you are not using a Japan Rail Pass, the ferry is the cheapest way to reach the city of Hakodate on the island of Hokkaido.